Mambo Grill, the 14-year-old popular Pan-Latin restaurant, currently located in River North at 412 North Clark, will temporarily close on March 31. Mambo Grill will reopen just two blocks away at 410 N. Wells St. this summer. "This is not ideal," said Susan Frasca, president of Frasca Hospitality Group, owners of Mambo Grill. "I had hoped to extend my current lease for 90 days, but the building owner and landlord, Dr. Shahid Sarwar, would not give us a lease extension," said Frasca. "We have no other choice than to close our doors and temporarily layoff employees." Mambo Grill has been around for fourteen years and Frasca has owned it for more than ten years. It boasts a long-term dedicated clientele. 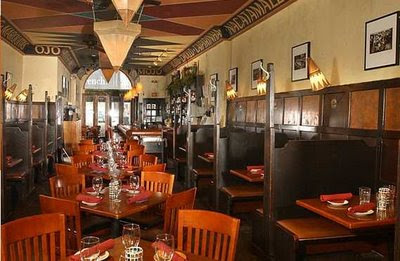 Frasca says "Restaurants are closing right and left and Mambo's sales are up 5% from last year. We are rocking and now we have to temporally close until the new space at 410 N. Wells is complete and operational." She adds, "It makes me sick to my stomach to have to tell my employees in these economic times that they have to find work elsewhere during the transition." Frasca also owns Kinzie Chophouse at 400 N. Wells Street just two doors south of the new Mambo Grill location. "I will take about 25% of the employees from Mambo with me over to Kinzie Chophouse but that is about all we can absorb." Says Frasca. Mambo fans don't worry, Frasca says, "the new location will be a breath of fresh air. While the menu will remain the same with a few new exciting additions, the physical plant will be 50% larger to accommodate the big groups who enjoy dining and celebrating at Mambo. She has designed the digs herself and has a huge smile on her face when she talks about the new layout. Frasca isn't budging to give away any details about the new space. She says it will be a big surprise but she will be posting updates, changes and a timeline for the grand opening on the restaurant's website.